This decision, taken by the Judicial Committee of the Privy Council in London, examines the constitutional validity of the Public Schools Acts adopted by the Manitoba government as well as said government’s power to “make declarations or remedial orders” concerning an act determined to prejudicially affect denominational rights. The Roman Catholic minority of Manitoba challenges the provisions of the Public Schools Act. These provisions made Catholic schools subject to various administrative requirements and did not provide public funding for them unless they complied with said requirements. "Can the appellants appeal against the Public Schools Act before the Governor-General in Council under section 22 of the Manitoba Act, 1870 ? Does “the Governor-General in Council [have] the power to make declarations or remedial orders” concerning an act determined to prejudicially affect denominational rights ?" The Judicial Committee of the Privy Council in London comes to the conclusion that the Public Schools Act prejudicially affects denominational rights to the Roman Catholic minority and that, therefore, the appellants have the right to address the Governor-General in Council. However, the Lords of the Privy Council do not invalidate the Act and determine that it is up to the Manitoba government to find the best way to remedy the prejudicial dispositions of the Public Schools Act by virtue of subsection 22(3) of the Manitoba Act, 1870. Two years later, the Manitoba government modifies the Public Schools Act and grants the Roman Catholic minority the right to ask that a Catholic teacher be hired if the number of Catholic students in the city in question justifies it. This decision addresses the constitutional validity of the abolition of the French language as a language that may be used before the courts by virtue of the Official Languages Act adopted by the Legislature of Manitoba in 1890. This decision is not published in law reports and only emerges in the limelight in 1977, when it is cited by the Court of Appeal in R v. Forest and Court of Appeal of Manitoba, (1977) D.L.R. (3d) 445. "Mr. Bertrand submits an application, which is written in French, to the tribunal. Said document is accused of being inadmissible because English is the only language that may be used before the courts by virtue of the Official Languages Act." "Was it within the jurisdiction of the Legislature of Manitoba to abolish French as a language authorized to be used before the courts by virtue of the Official Languages Act ?" The County Court of St. Boniface comes to the conclusion that it is not within the province’s jurisdiction to amend section 23 of the Manitoba Acts, 1870. The Court holds that section 23 is the Manitoban incorporation of section 133 of the British North America Act and that, in that sense, the Legislature of Manitoba cannot change section 23 unilaterally. According to the Court, the intent behind the Manitoba Act, 1870 and the British North America Act is to confer a protection that cannot be modified by the provincial legislatures regarding the use of French and English before the courts. This decision mainly concerns procedural law. The Court of Appeal questions its jurisdiction to hear an application for an order of mandamus asking that the Court accept to hear a motion drawn in the French language. The application for mandamus, written in French, asks the Court to declare Manitoba’s laws inoperative and to require that the Manitoba government translate the province’s laws into French. Mr. Forest, continuing his crusade in the name of the francophone minority of Manitoba’s language rights, files an application for an original order of mandamus, composed in French, in the province’s Court of Appeal asking that the Manitoba government translate its laws into French, said laws being only published in English by virtue of the Official Languages Act. The Court of Appeal refuses to hear the request on the grounds that accepting to do so would constitute a prejudgement about the constitutional validity of the Official Languages Act. Therefore, Mr. Forest composes a new application for mandamus, but this time in English, asking that the Court accept the application that is written in French. "Does the Court of Appeal have jurisdiction to hear the application for mandamus asking that it accept a request for mandamus written in French? If not, which tribunal does have jurisdiction?" The judges forming the majority, that is Freedman, Guy and Hall, find that such a request must be held in front of the Court of Queen’s Bench because, according to them, as the language issue is “one of importance, it [is] desirable that it receive the attention of every level of the judicial process, including that of the Court of Queen’s Bench”, each in turn. Moreover, they contend that the Court of Queen’s Bench is “a more appropriate forum to hear evidence with regard to consequences of” a judgement declaring Manitoba’s unilingual Acts inoperative. This decision concerns the legality of the Official Languages Act, which provides that only English may be used before Manitoba’s provincial courts. The Court analyses the ties between section 93 of the British North America Act and section 23 of the Manitoba Act, 1870. Mr. Forest, sentenced to pay a fine by virtue of a contravention of parking regulations, seeks to appeal this condemnation and presents the documents that support this appeal. The Crown objects to the submission of said documents, as they are composed in French, by invoking that they are null by virtue of the Official Languages Act, which establishes that the Court’s judicial proceedings are to be held exclusively in English. Mr. Forest turns to the Manitoba Court of Appeal to have the Official Languages Act declared inoperative. "Can Manitoba’s legislature, by virtue of section 92(1) of the British North America Act, modify section 23 of the Manitoba Act, 1870 by making English the only language that may be used before the courts? If not, must the Official Languages Act be declared inoperative?" The Manitoba Court of Appeal bases itself on section 23 of the Manitoba Act, 1870, which stipulates that English and French may be used by anyone during judicial proceedings before any judicial court throughout the province. The Court comes to the conclusion that this section is part of the province’s constitution as well as Canada’s constitution because it establishes the right to use one or the other of the two official languages before the courts; a principle constitutionalized notably by section 133 of the British North America Act. Consequently, Manitoba’s legislature cannot unilaterally modify section 23 of the Manitoba Act, 1870. While not declaring the entre Act inoperative, the Court concludes that the provisions in the Official Languages Act declaring English the only language that may be used before the courts are ultra vires and inoperative. In this reference, the Federal government asks several questions to the Supreme Court of Canada regarding the equality of language rights in the province of Manitoba. The Governor General in Council ordered the reference following section 55 of the Supreme Court Act. It addresses, amongst others, section 23 of the Manitoba Act, 1870 and section 133 of the Constitution Act, 1867. These two sections were the core topics of many appeals prior to this reference. “[T]he requirements of 133 of the Constitution Act, 1867 and of s. 23 of the Manitoba Act, 1870 respecting the use of both the English and French languages in (a)the Records and Journals of the Houses of the Parliament of Canada and of the Legislatures of Quebec and Manitoba, and (b)the Acts of the Parliament of Canada and of the Legislatures of Quebec and Manitoba” are mandatory. This is required in accordance with section 133 of the Constitution Act, 1867 and with section 23 of the Manitoba Act, 1870. “[T]hose statutes and regulations of the Province of Manitoba that were not printed and published in both the English and French languages” are “invalid by reason of s. 23 of the Manitoba Act, 1870”. However, “the invalid current Acts of the Legislature will be deemed temporarily valid for the minimum period of time necessary for their translation, re‑enactment, printing and publication.” To take such a decision, the Court also draws from Attorney General of Quebec v. Blaikie,  2 S.C.R. 1016, and Attorney General of Quebec v. Blaikie,  1 S.C.R. 312. The law that were not printed and published in English and French do not have any legal force and effect, but are deemed temporarily valid for a certain period of time. The Supreme Court comes to this decision in light of section 23 of the Manitoba Act, 1870, which enshrines the requirement to enact, print and publish all the Legislature’s laws in the two official languages. This section therefore imposes a constitutional obligation to the Legislature of Manitoba regarding the future adoption of laws. An Act Respectingthe Operation of Section 23 of the Manitoba Act in Regard to Statutes is invalid and has no legal force and effect as if it was not adopted, published and printed in the two official languages. If, however, it was adopted, published and printed in both official languages, it would have been valid." 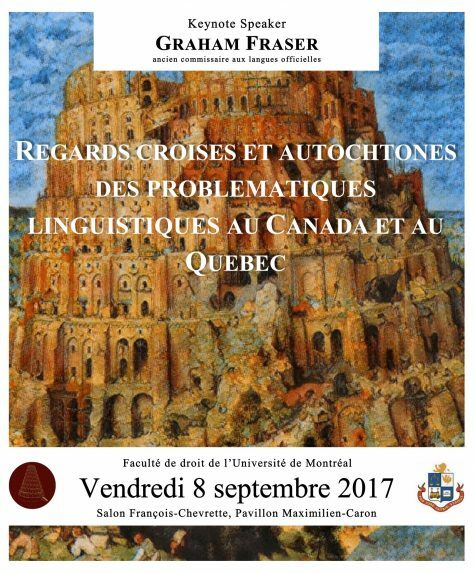 A decision concerning the linguistic rights of the Francophone minority of Manitoba. The decision follows that of Re Manitoba Language Rights, rendered in 1985 with respect to the constitutional obligation of Manitoba to compose their laws in the two official languages. Mr. Bilodeau, a Franco-Manitoban, is accused of violating The Highway Traffic Act due to excessive speeding and receives a subpoena in virtue of The Summary Convictions Act, two laws printed and published only in English. The accused pleads the unconstitutionality of these laws and argues that composing laws uniquely in English in the Province of Manitoba violates section 23 of The Manitoba Act of 1870, the Manitoban equivalent of section 133 of the Constitution Act 1982. "Are The Summary Convictions Act, R.S.M. 1970, c. S230 and The Highway Traffic Act, R.S.M. 1970, c. H60 ultra vires, invalid, or non-operational due to the fact that they were not printed and published in both the English and French languages as required by s. 23 of the Manitoba Act, 1870, but in English only?" The Supreme Court acknowledges the invalidity of laws printed and published solely in the English language. They violate section 23 of the Manitoba Act, 1870. However, the Court does not question the binding nature of these laws. For one, the principle of validity de facto preserves the rights and obligations established before the Re Manitoba Language Rights decision in 1985. Secondly, the principle of the rule of law has the effect of preserving the binding nature of the summons as was confirmed by the Court in Re Manitoba Language Rights. Shortly before Mahé, this decision questions the existence of the linguistic minority population’s right to receive their instruction in a separate setting by virtue of section 23 of the Charter. The decision also questions the existence of a right to manage and control by virtue of said section. The Lieutenant Governor in Council of Manitoba asks the Supreme Court for its’ opinion as to whether 79(3), 79(4) and 79(7) “of The Public Schools Act meet Manitoba’s Constitutional obligations pursuant to” sections 15 and 23 of the Canadian Canadian Charter and Freedoms. These provisions provide the number of students required in a school district or division so that they can receive their education in the official language of their choice. “Does the combined effect of sections 79(3) and 79(4) and 79(7) of The Public Schools Act meet Manitoba’s Constitutional obligation pursuant to section 23 of the Canadian Canadian Charter and Freedoms”? If so, “may the legislature specify any number as either a minimum number or guideline for the provision of French language education? What does the right to have one’s children receive instruction “in minority language educational facilities” guaranteed by s. 23(3)(b) of the Charter mean? In particular, does it include the right to have one’s children receive instruction in a distinct physical setting? Do s. 23 and s. 15 of the Charter grant any right of management or control in connection with s. 23’s guarantees of French-language instruction and facilities” to the parents who are part of the linguistic minority? The Court of Appeal held that section 23 of the Charter gives rights to the individuals who are members of the linguistic minority, rather than to the linguistic minority as a whole. However, it recognises that the imposition of a minimum number of required students to offer French language education infringes on section 23 of the Charter. The evaluation of the number of students needed to establish a linguistic minority school must be done by the courts. The Court adopts a restrictive interpretation of these linguistic rights and stipulates that sections 23 and 15 of the Charter do not include the right of management or control of the instruction and the educational facilities or the right to receive instruction in a distinct physical setting. This reference occurs shortly after the Mahe judgement. The Mahe judgement, although definitive, is insufficient to determine specifically the manner in which the province of Manitoba must respect the language rights guaranteed by section 23 of the Canadian Charter. In this reference, the Supreme Court clarifies the scope of this decision with regards to Manitoba, by answering the questions, which were submitted to the Court. In 1986, French-speaking parents decided to sue the provincial government for damages based on section 23 of the Charter before accepting to proceed via a court reference. The Manitoba government submitted several questions regarding the constitutionality of the Public Schools Act with regards to sections 15 and 23 of the Canadian Charter to the Manitoba Court of Appeal. Three questions were appealed to the Supreme Court of Canada. The Manitoban Court of Appeal rendered its judgement before the Court came to a decision in case Mahe v. Alberta. The reference in question does not establish the manner in which the language rights guaranteed by section 23 of the Canadian Charter apply to Manitoba. Consequently, this reference cannot be characterized as being purely theoretical. "b) What does the right to have one's children receive instruction "in minority language educational facilities" guaranteed by section 23(6)(b) of the Charter mean? In particular, does it include the right to have one's children receive instruction in a distinct physical setting? (c) (i) Do section 23 and section 15 of the Charter grant any right of management or control in connection with section 23's guarantees of French language instruction and facilities? c) (ii) If so, do the provisions in Part I, II and III of The Public Schools Act concerning the formation of school divisions and districts, the election of school boards, and the powers and duties of school boards meet Manitoba's constitutional obligations with reference to such a right of management and control? If not, in what essential elements do the provisions fail to do so?" Question b) was answered in the affirmative. Reiterating the interpretation contained in Mahe, the Court states that the word “facilities” encompasses more than just buildings. Therefore, it becomes necessary that parents have control over the settings in which their children are being educated. This control may only be exercised if the educational facilities belonging to the linguistic minority group constitute a distinct, physical setting. The question c) (i) was also answered in the affirmative. The Mahe judgement answers this question. The Court thus reiterates its position: in the context of a linguistic minority, said minority has a right to manage and control the educational facilities in which its children are taught. This management and control is dependent upon the number of potential children who will take advantage of program or facility in the minority language that is being contemplated. In Manitoba, the number of children in the linguistic minority falls within the high end of the sliding scale and thus justifies the creation of a French school board. The third question received a negative answer. R. v. Rémillard,  No. 387, M. J. (C.A. Man.). In this decision, the Court questions the scope of the application of Part 9 of the Charter of the City of Winnipegand of the Official Languages of Municipal Services By-law inside a Riel area designated as bilingual. More specifically, the Court questions whether the obligation of bilingualism under these legal instruments shall apply to Offence Notices issued by the police under s. 13 (1.1) of the Summary Convictions Act. The Crown appeals against a trial court judgment declaring the Offence Notices issued to the respondents as invalid as information contained therein was not written in French, despite the fact that the defendants reside in a designated bilingual area. The Court concludes that it should not answer the first question because it was not raised at the time of the call. Moreover, it rules that the right to make a complaint to the ombudsman to report that the city has failed to meet its obligations - a right provided for in section 463 of the Charter of the City of Winnipeg - is not the only available remedy. Indeed, the Court ruled that the Offence Notice may have its validity challenged before a court of justice and that the latter may determine the appropriate remedy if it finds the notice invalid. In addition, the Court held that the trial judge was not required to amend the Offence Notice so it would be in conformity with the language requirements. It concludes that such a change would be an accommodation, and not an appropriate remedy, which would diminish the importance of the City’s obligations and undermine the language rights of the residents of the area designated as . This content has been updated on 7 April 2016 at 15 h 20 min.